Not cholera. Typhoid. I’m here for another two weeks, they say. The fever is down but there are various reasons why they have to keep my here. I have only grasped the bare minimum. They don’t talk to me much. Maybe I’m contagious, still? The clerk brought the credit card to the hospital while I was unconscious. So I have that now. As soon as I am stable enough to walk I will try that travel agent again. As soon as I am cleared to return. I feared this might be something they won’t let me into the country with but as far as I have been able to determine from peppering the staff with questions, I’m not the first American tourist to come down with it and the others were allowed to go home. There’s no phone here that they will let me use. But I would not call and worry people now. The last thing they all need to do is freak out that I’m stuck in an Indian hospital for two more weeks. No, I’ll fly home, get my game face on, and meet everyone on my own terms. I am such a dunce, I just noticed you can vote DAILY on Top Web Fiction. In awe of how many plausible, realistic details you weave, Ctan. That was a great diary, thanks! And there he goes again, closing himself off. Pretending. ‘Getting his game face on’ because he doesn’t feel worthy enough to be worried about, strong enough to feel vulnerable. Yeah, typhoid. Fortunately that’s something people can make a full recovery from, though it’s completely debilitating while it’s happening. I was just reading an article about a major league baseball player who caught it while on vacation! I had to have a typhoid vaccine and wound up having a reaction to it. Talk about making me sick! I definitely wouldn’t want the real thing. Ugh! Oh ouch. Sometimes just the regular flu shot makes me ill for a day, so I can imagine! Huh, how odd. I’ll have to test that with my iPhone. It might be something in the theme that I can’t fix myself, though. I’ll poke around. Thanks for letting me know! No spoiler, but what an awesome bene in my mail-and who knew you can do that with a guitar and it remains playable? Oh, my god, now I have to go read it! I was putting it off for tomorrow, but my curiosity burns. Alright, Zig. Let’s not go all the way back to square one. ctan, I have the same problem Seana does on all of my devices. Billy, I’m testing it out now. Seems on the iPhone I can reply if I Exit the Mobile version of the site, but I get the same error as Seana in the mobile view. ERROR:Can’t find the ‘commentformid’ div. Ok, so the issue isn’t me and my tech-ineptitude….then again, my Kindle had to reboot…twice…when I tried to open the bene as a PDF. *sigh* My devices hate me. It’s not long, so I’ll just read it on my phone. I really want to know! *looking across the room at guitar as imagination runs wild* Hmmm…. Try opening the .mobi file on your Kindle instead of the PDF? Mobi is optimized for Kindle devices. When did you get so tech savvy? Heh. If I have a tour addiction, it’s books. Thank Matthew for that. It was very interesting to see Ziggy’s thought processes and development like that, thanks for writing the diary! It gave me a bit to think about for myself, too. Thanks so much for this. I really needed some Ziggy-time. 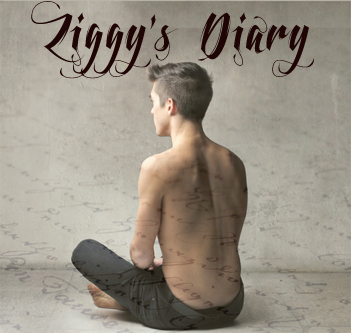 ctan, it just struck me that with some selective elements from the first 450 or so posts to give context, Ziggy’s Diary could be a stand-alone novella as with Spanish Nights. Frankly, the title that comes to mind is “Magical Mystery Tour.” That certainly describes a trip through Ziggy’s brain.